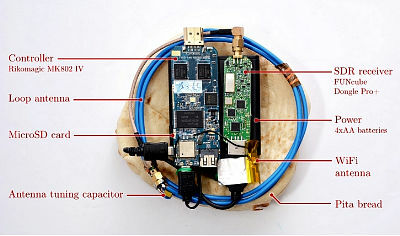 There’s a new and clever way of hacking into computers, and it can be done cheaply – Using just a radio receiver and a piece of pita bread. Yeah, you heard it right. Security researchers at Tel Aviv University have demonstrated how to extract secret decryption keys from computers by capturing radio emissions of laptop computers. Capturing the radio signals to steal data from a computer system is nothing new. But the process required expensive, bulky lab equipment to accomplish. However, the Israeli-based researchers team managed to do it with cheap consumer-grade components as well as small enough to hide inside a piece of pita bread. Using cheap equipment, the team of researchers, including Daniel Genkin, Lev Pachmanov, Itamar Pipman and Eran Tromer, was able to capture keystrokes, applications running on a computer system, and encryption keys.